The show revolves around a series of monster trucks crushing cars, a motorcycle show and car stunts, basically everything you see in movies or the Moteurs… Action! Stunt Show Spectacular in Disneyland Resort Paris! The show was organized by a crew of professionals and the sons of the head stuntman. 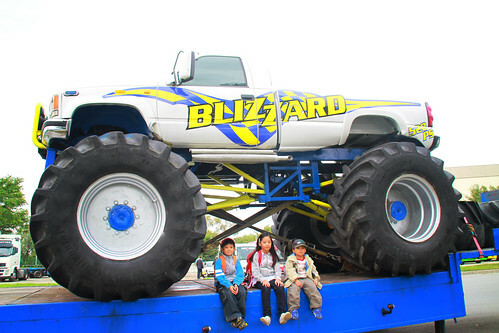 They have a number of cars and motorcycles on show, three monster trucks, ramps, pyrotechnics and scooters. The main showman showed off his skill on drifting, tilting the car, wheelie-ing and at one point escaping a crashed vehicle unscathed. His son, about 16-years-old was also under the spotlight, he was being trained to follow in his dads footsteps as was his older siblings. I didn’t pay attention to the model /make of the cars used during the show, but for sure these guys must know a lot of car dealerships to secure the number of vehicles needed for the show. Or it could be that they also have a maintenance garage somewhere to fix all the crushed cars, sacrificed for the show. There was also fire during the show, which makes it really “extreme” – especially for kids in the crowd. 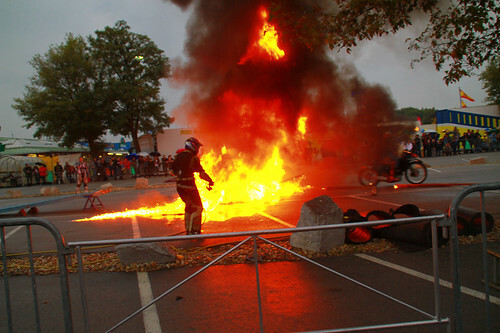 They get speechless when they see fire ablaze- they’re much more surprised than when seeing motorcycles fly from one ramp to the other. 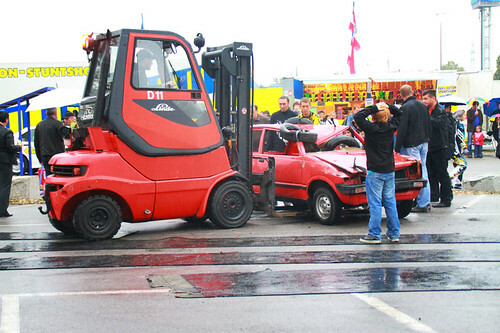 At the end of the show, the monster trucks were brought in to totally wreck the smaller cars. See here they are modified with extremely large wheels and suspension…what car would survive that? They are certainly the kings of motorized wrestling.